It took a few centuries for the landlubberly Romans to master the craft of shipbuilding and the art of sailing, but once this was achieved they set about dominating the seas with their usual grim and ineluctable determination. The Mediterranean became Mare Nostrum, Our Sea, an internal waterway linking the stations of the Empire. With the invasion of Britain in AD 43 the Roman waterway was extended westwards, to the edge of the known world. This pharos, or lighthouse, standing within the walls of Dover Castle, is one of two that were built to guide the Empire’s ships across the Channel. Little remains of the lighthouse built on Dover’s Western Heights, but this one on the Eastern Heights has survived and is dated to AD 46, which must make it the earliest Roman structure in Britain still standing. It would have served as a beacon for Dover harbour itself as well as a way-sign for the port of Richborough, further up the Kent coast. The surviving structure does not convey how impressive a sight the lighthouse would have been when first built: more than 100 feet tall, twice its current height, and with stepped walls rising to its summit. 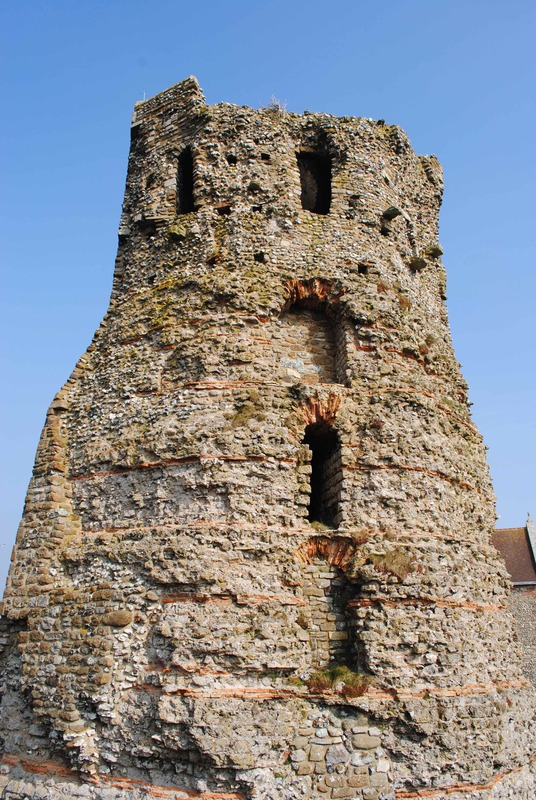 What remains is a less geometrical building with three original stories and a fourth that was added in the medieval period, when it was used as a watchtower. Little is known about how Roman lighthouses operated but the beacon would have required constant attention to keep it lit and sufficiently bright, especially in bad weather. Would this task have been regarded as a skilled and prestigious duty or the horrible night shift that every auxiliary wanted to avoid? Portus Dubris (Dover) was to become the main base for the Empire’s British fleet, the Classis Britannica, and when the legions exited the province almost four hundred years after their arrival it’s likely that they left from Dover. The pharos at the top of the white cliffs would have been one of the last sights of Britannia that these men, glancing back at the misty isle, would have seen, a stick of Roman rock left by the Kentish seaside.